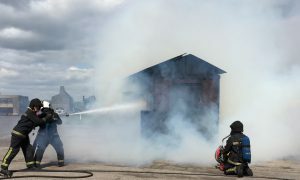 Angus Fire’s Rimseal Foam Equipment is used for the protection of vertical Open Top Floating Roof (OTFR) storage tanks. Some OTFR tanks are fitted with Geodesic lightweight roofs to maximise vapour recovery and to keep the weather out. These lightweight roofs are often of a construction that will not support the weight of a conventional fixed foam pourer. Provided the tank roofs are fitted with rimseal foam dams, there is now the option of fitting the Angus Geodesic Rimseal Pourer. These units comprise of a Rimseal Foam Generator (RFG) which produces expanded foam when supplied with foam solution and a Geodesic Rimseal Pourer which delivers the foam gently into the rimseal area. Find out more in the attached datasheet.